Eduard Dimasov (1984) was born and grew up in Perm. In 2006 he graduated from the Perm State University, Philosophy Department. 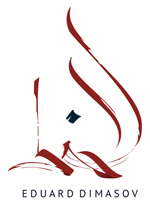 The young artist is now engaged in Modern Arabic calligraphy, identica, design. Eduard Dimasov began his career almost a year ago. During this short period his work became popular in Russia and abroad.